Situated on the southern Fraser Plateau, where the Fraser River carved its way through an ancient lava flow, the Big Bar Lake area seems to invite visitors to take a deep breath and take in the pleasures of summer. The dry climate supports forests of lodgepole pine and fragrant spruce, which are scattered across a rolling landscape of grasses, small lakes and ponds. Set against a mountainous backdrop, the land is scenic and inviting. It is little wonder that the Southern Cariboo is home to many guest ranches and is extremely popular with campers and wilderness enthusiasts. The lake is rimmed by life-supporting aquatic vegetation, and though it reaches a maximum depth of only 5 meters, the rainbow trout fishery is excellent, with many fish in the 2 lb range, and some reaching about 6 lbs. Bird and small aquatic life around the lake is plentiful. With a maximum boat speed of 10 km/hr, motor impact and noise is kept to a minimum. There is a 3.5 km self-guided Interpretive trail through Otter Marsh. Mountain bikers can take the road to Jesmond Fire Lookout for a great view of the Fraser River and surrounding mountains and rangelands. Due to the fragile soils, there is no off-road biking permitted, and ATV’s are prohibited. 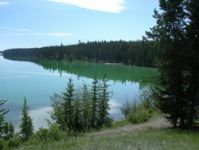 Whether you chose to put a chair on the lakeshore and read a book in the warm shade, launch a canoe across the still water and cast a fly, or dive into the lake from the sandy beach, there are plenty of outdoor pleasures for the entire family at Big Bar Lake Provincial Park (332 h). Nearby guest ranches offer horseback excursions into the open forests and through the rangelands. This park offers a good day-use area and vehicle accessible campsites on a first-come, first served basis. The Lakeside Campsite has 25 sites that overlook the lake. The Upper Campsite, which can accommodate larger vehicles, is set in a small forest. There are pit toilets throughout, and water taps for drinking water. Campfires are permitted within the campfire rings provided with each site. A paved boat launch accommodates smaller boats. The park is located approximately 42 km northwest of Clinton. Take Highway 97 north of Clinton for 8 km until you see the signs for Big Bar Lake. Take the gravel road for another 34 km to reach the Provincial Park.